In a sequel to Turkey Trouble, also by the duo of Silvano and Harper, Turkey finds that he may yet be the centerpiece for a holiday meal. Though he made it safely through Thanksgiving without being eaten, Turkey now overhears Farmer Jake and his wife, Edna, discussing a Christmas turkey dinner. Turkey heads to the North Pole in hopes of Santa Claus solving his dilemma, but he’s turned away by elves protecting Santa’s time on the day before Christmas. 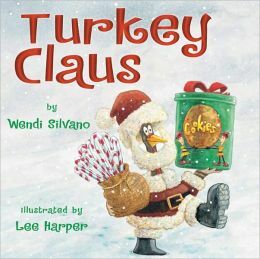 Silvano and Harper cleverly adorn Turkey in fun, holiday-themed disguises to hopefully gain entrance to Santa’s presence. Though he strikes out with most of his disguises, Turkey finally sneaks in, hidden in a gift, and Santa saves the day. Turkey, dressed as Santa, delivers Gobblers Pizza to the farmer and his wife, just in time for dinner. The illustrations are charmingly delightful, and the elves comments to Turkey are sarcastically humorous for adult and children’s entertainment, yet seriously explanatory to solve the mystery of each disguise. “Candy canes don’t have beaks,” explains the elf when Turkey is surprised that he’s discovered. Parents and teachers will enjoy adding this humorous second grade book to their holiday reading list for must-read-alouds. Following the story, adults can use this website http://belladia.typepad.com/crafty_crow/2009/11/the-biggest-list-of-turkey-crafts-for-kids-to-make.html to find a three-dimensional turkey craft. After the children complete a turkey craft, supply them with various Christmas arts and crafts supplies (be sure to supply some unusual, atypical crafty kind of items to stir their imaginations) for each child to create a holiday-themed “disguise” for Turkey. Then, pair each child with a friend to act out an elf-scene from the book. Encourage one child to use his turkey to say, “May I please see Santa?” Have the (elf) partner reply with, “No turkey is getting in here today!” When the “turkey” says, “How’d you recognize me?” the (elf) partner replies with an acceptable answer to match his/her disguise. Children will enjoy reading this unique Christmas story (most Christmas stories don’t have a turkey dinner as the theme of the book) during the December season as a fun twist to the usual holiday-ish kind of story. The story will stir their imaginations, and kids will find themselves attempting to think of other disguises for Turkey, because after all, who wouldn’t want to gain entry to Santa’s presence?